The Census Bureau just released a report on America’s aging population. The big takeaway is that our population will be getting much older between now and 2050. And since I’m a baby boomer, I very much like the fact that we’re expected to live longer. But as a public finance economist, I’m not nearly as happy. As I explain in this interview with the Wall Street Journal’s Digital Network (and as confirmed by BIS, OECD, and IMF data), the United States is going to get deluged by a tsunami of entitlement spending. I mentioned that it’s important to focus on the ratio of workers to retirees. This “dependency ratio” matters because economic output largely is a function of an economy’s working-age population. To cite my famous cartoons, you need a sufficient number of people pulling the wagon to support those riding in the wagon. Here’s a chart from the Census report to help you understand the magnitude of the problem. 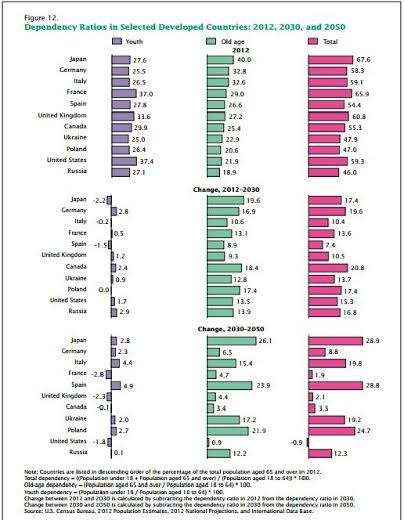 As you can see, both in the United States and other nations, the increase in the dependency ratio is almost entirely the result of aging populations. This is why I said that we face a slow-motion train wreck because of poorly designed entitlement programs. But the good news is that there is time to reform those programs and avert a crisis. Which explains why I probably sound like a broken record about the need for genuine entitlement reform. In a column citing the new private pension system in the Faroe Islands, I gave the arguments for modernizing Social Security with personal retirement accounts. But we also need to deal with the health entitlements. Here’s how to fix Medicare. And here’s how to fix Medicaid. By the way, some of the damaging provisions of Obamacare can be de facto repealed by including them in the Medicaid block grant, so it’s a critically important reform. Needless to say, I think these reforms are far better for the economy than the big tax hike Obama has endorsed to deal with the giant financing gap. P.S. For a clever look at the worker-dependency ratio, check out the party ship produced by a Danish think tank. P.P.S. The interviewer also mentioned that America’s racial composition is changing, which gives me an excuse to point out that Social Security reform is particularly beneficial for blacks because of differences in life expectancy. I agree with the top answer. Entitled to our Social Security that ONLY we paid by the FICA tax and our employers matched dollar for dollar as an insurance that it would be there with compounded interest from being invested by our government in trustworthy assets after paying for the current generation is NOT an Entitlement or Welfare Plan. It is insurance. LBJ moved this pot of gold into his general budget to make it LOOK balanced from his war chest from Nam. Then the Democrats in Congress saw a Pot of Gold to spend any which way they pleased. Well they OWE the seniors a Hell of a lot of money plus interest. that’s a lot of dough. And they were Democrats. They controlled Congress most of the time. They same ones sometimes who voted to take out $738 BILLION DOLLARS OF MEDICARE MONEY FOR OBAMACARE AND THE CREDITS GIVEN TO THOSE FOLKS AND UNDER 65. AND WHO DID THAT; THE DEMOCRATS AGAIN. well, SS and Medicare are not Entitlements they are the LAW to cover seniors. and we paid for them. So I hope Trump realizes it and takes away the money out of their salaries to pay us all back. It is not the entitlement that is hurting our budget. At this time if you check there is 2.7 Trillin dollar deficit in social security. Like Ibamacare. Obama borrowed 500,000,000 dollars out Medicare for the program. Other money being borrowed are for refugees illegal immigrants. This money has been coming out social security for years. The borrowing from social security by the president started way back in Johnson administration to pay for Vietnam. War. No accountability. It was taken out trust and put in General treasury fund by Ronald Regan. Every president been borrowing the money with no intentions of paying the debt back. Aging population? Time to import a tsunami of Muslims! They’re turning Europe into a paradise! In the comment above, I mentioned that cash paid into Health Savings Accounts would be better than vouchers. What is cash anyway other than a voucher from government. However, people will be more careful with cash. Should they somehow raid their account, no one else is hurt. If they can save by being healthy or frugal in their choice of healthcare, the residual would build for future emergencies. Vouchers must be spent immediately, since there is no way to trade current health value for future health value plus time value interest. Giving people cash will provide funds for healthcare coverage, however, free riding can no longer be allowed. If an individual tries to save by not buying insurance, he should face the full liability of the medical bills which will wipe out any “saved” funds in his HSA and then some. This approach is far better [and more aligned with Constitutional limits] than the current mandated purchase. Every adult citizen could receive a cost neutral $3,000; to be paid out of current programs including: the value of the healthcare tax deduction, Medicaid support for the poor, a portion of Medicare, and ACA support. The poor would have funds to buy healthcare. The cash would more than replace the healthcare tax deduction, except for Cadillac plans. [However, front end cash would make for better healthcare selections.] Those on Medicare would see no change, since benefits would be reduced by that $3,000. While I’m a big fan of either vouchers or [better] cash deposited into Health Savings Accounts; the proposal to match the dollar value of current payments and then increase it by GDP growth plus 1% will break us. Superficially, it is flawed because it violates Mitchell’s Rule on spending. However, the thrust of this article was to describe how the number of retired will double. That means that the underlying costs will double, even before we hit the cost escalators. We must fulfill our commitments to seniors, however, we must stop all future commitments. Current retirees are 100% vested, because of previous FICA payments. We should stop FICA payments and the sham of “Trust [me] Funds”, immediately. All payments should come out of General Funds. Beginning next month, retirees will only be partially vested. For every month they don’t pay FICA, their eligibility gets pushed back by 1/3 of a month. In thirty years retirement age will be pushed back to 76. People will start saving immediately to fill in the anticipated gaps. That saving will kick-start the economy. Politicians will no long be able to raid the Trust Funds for current spending. It is flawed thinking to believe that the young will be overly burdened by an aging population. As the non-productive become a larger percentage they gain political power. However, as the productive become a smaller percentage, they gain economic power, and economic power trumps political power. Sometimes it’s effective to describe a ridiculously extreme case to highlight flawed thinking: Assume one person makes the world run. No matter how much is demanded of him politically, he requires half of world production as compensation for his services. Who will win this argument? Now replace this one man will an ever smaller group of producers. Who will win? Because there are limits to the share taken by the elderly, that share will have to be divided by an ever larger contingent. It is misplaced to feel sorry for the future’s young people. Another of the definitions of insanity: refusal to change policies and programs that are clearly headed for disaster. Also, progressives. The government theft of social security funds and medicare funds over decades does not create an “entitlement problem”. These piggy banks are being raided by fraud, illegal payments to non contributors, fraudulent disability claims. These Funds should have been, from day ONE, separate business units, OUTSIDE THE US TREASURY BUDGET. They exist much like insurance companies that operate annuities and health insurance services. If insurance companies spent their reserve, they would be bankrupt. Social security has been calculated to be funded until 2032. A few changes now may push that crunch date forward decades. Raise salary contribution ceiling to $140,000, stop fraud, stop giving away funds to illegal aliens, extended families of immigrants, disability fraud claims…simply stop using SS as a welfare fund. It is very disturbing to see media people use the term entitlement, as though it were free payments to demanding seniors, as a form of welfare. A LIE. These Funds are Business Units that should be operated as a separate business, unhampered by government, politics, the Treasury, and certainly not part of the Budget. Due to government abuse, the DEBT to SS and medicare is now a budget debt item as a payment on loans taken out by politician abuse. The SS fund is solvent, accounting – wise, until 2032. The above changes would keep it solvent into the future.